This work extends previous research and presents a series of microscopic views of suspected aerosol ground samples received in November and December of 1999. 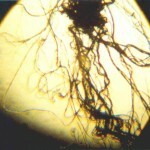 A set of known fibers, both synthetic and natural, is presented for comparison purposes. The two samples received were deposited on the ground several hundred miles apart from one another, and yet they have identical characteristics in all respects. 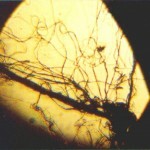 The first sample was directly correlated with aerial activity; the second sample was found by a motorist on an open and paved highway in the Sacramento CA area (airborne fibers were observed prior to photography). All photographs were taken at the same magnification, 100x. 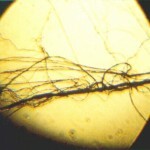 Study reveals that these samples are comprised of microscopic fibers which measure less than 1 micron in width; the nearest analogy to this situation would be comparable to the issues raised with asbestos fibers. It is known, however, that the materials collected and shown herein are NOT asbestos. There are potentially serious health issues that arise with the presentation of this data. 1. 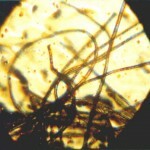 The size of the fibers; microscopic and not normally visible to the human eye. The material is extremely adhesive and elastic. 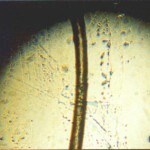 It is essentially impossible to separate individual fibers from one another once they have made contact with each other. Reports commonly indicate the material dissipates in the atmosphere upon exposure to the elements, however, the samples received do not appear to be especially volatile. 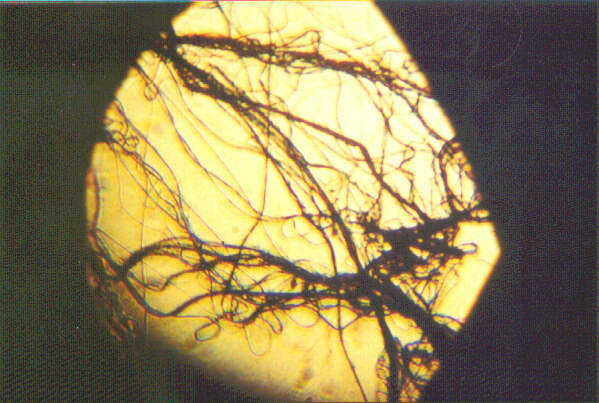 Upon being sealed in a plastic bag in a frozen environment for the majority of time, the material has maintained form since at least Nov 2 1999. Eyewitness accounts of material similar to that being described herein have accumulated over the past year and earlier in direct connection with unusual aircraft activity. There is at least one video available that substantiates these reports, showing aircraft activity and web like material reaching the ground shortly afterwards. 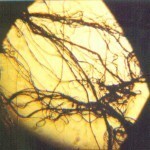 The material appears to be synthetic in nature, although the chemical composition remains to be determined. Certain individuals have suggested identification of the material as either a natural fiber, a common synthetic fiber or as spider webs, but further analysis does not support those claims. The adhesiveness of the shown material is especially significant; it commonly takes three or more passes to separate the material once it has attached itself to a needle or scalpel. 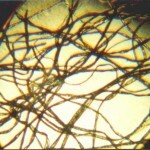 Small groups of fibers are easily and more naturally prone to becoming airborne; it requires some finesse to allow the surface tension of a microscope glass side to permit adhesion to the surface. Some chemical tests have been performed upon the material, and they will be described in greater detail in a later section of this report. 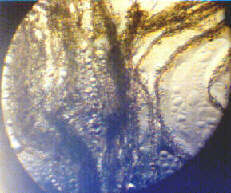 A microscope is the tool of choice for more detailed visual analysis. 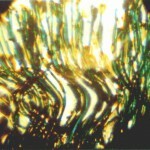 Six microphotographs have been presented above to reveal the finer characteristics of this material; full size and thumbnail photographs are available above. 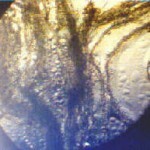 The photographs taken are with a microscope stage illuminated from below, and therefore much of the imagery is a result of shadow. A set will be taken in the future with the stage illuminated from above; these will show the white and somewhat translucent characteristics more readily. Comparisons have been made at the microscopic level with all suggested fiber candidates, including wool, silk, spider webs, cotton, polyester, nylon, and acrylic. 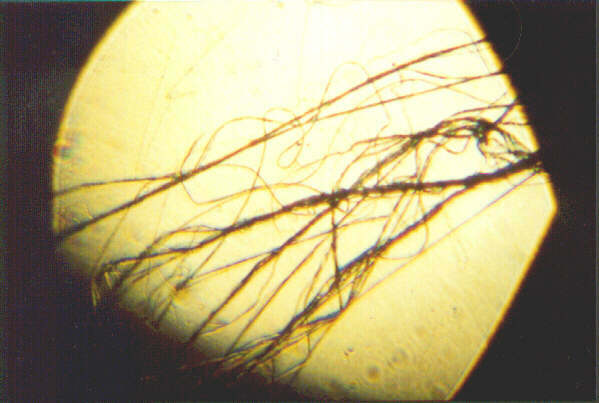 A human hair has been photographed also for size comparison. Visually it becomes quite clear that the ground sample material is not a match against any of the candidate comparisons. 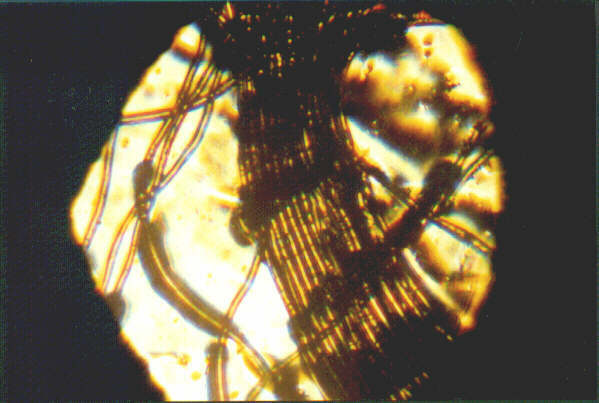 The microscopic wave feature of the ground sample is unique in itself, and is not to be seen in any of the alternative fibers presented. The microscope also reveals that what may appear to be a single fiber under normal vision is actually composed of scores to hundreds of actual fibers. The size of the ground sample fibers is another of the remarkable qualities found, and also will be discussed in greater detail under the metric section of this report. 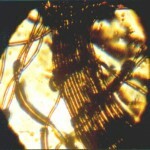 In addition to being substantially smaller in size than the spider webs that were measured at 7 microns, the fibers of the ground sample shown are uniformly adhesive, and show no such separation of function or form. 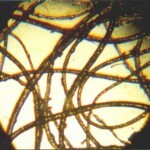 No fluid substance is visible on the exterior of any of the ground sample fibers. 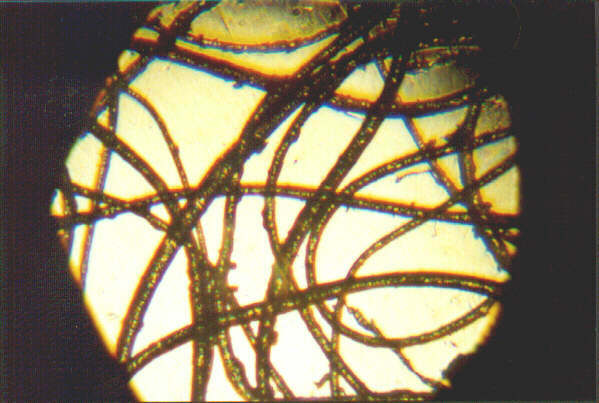 Spider webs do not possess microscopic wave forms, and are not formed at the sub-micron level. 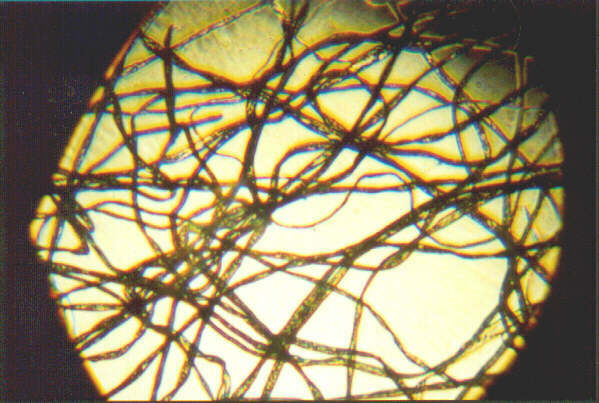 Wave forms are fairly common in synthetic fibers such as nylon and polyester. 1. 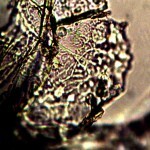 Microphotographs at a comparable magnification that show sufficient similarity of form. 2. 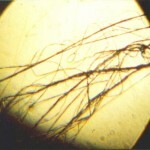 Measured spider web fibers at the sub-micron level. 3. 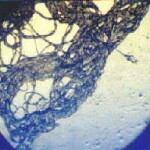 Microscopic wave forms within the spider web fibers. 4. 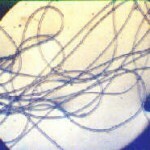 Uniform adhesiveness along the length of all spider web fibers. 6. Seasonal and locale compability with the collected ground samples. In addition, any spider webs presented will be required to be submitted to a series of chemical tests which are presented later in this report. Identification of species will also be required. The substantiating data with respect to spider web claims has not been presented at this time. Steps were taken to determine the width of the ground sample fibers, as well as of the candidate comparison fibers. 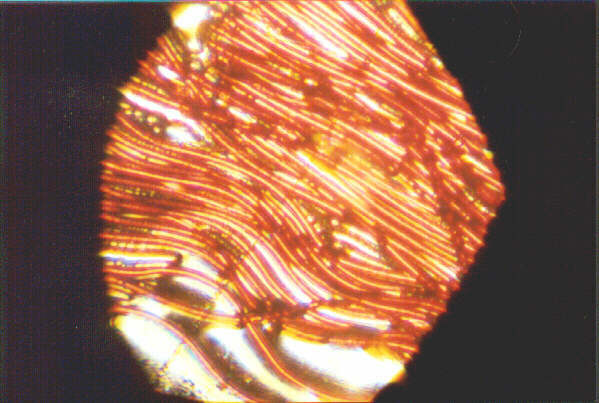 This was accomplished using a relatively simple technique with a consumer grade projection screen microscope. 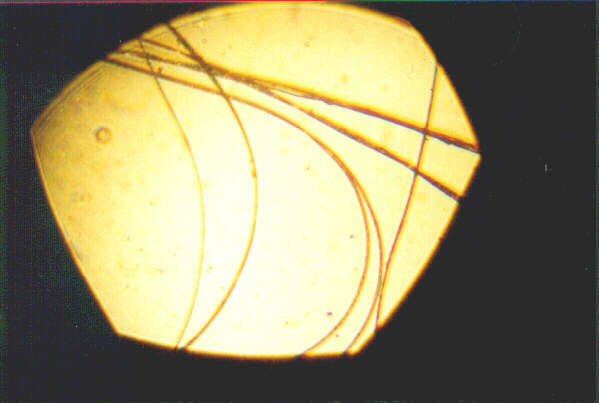 A proportional relationship was established between the screen dimension(17.05cm) of the microscopic and the measured field of view with a ruler (9.00mm) at a particular level of magnification (20x). 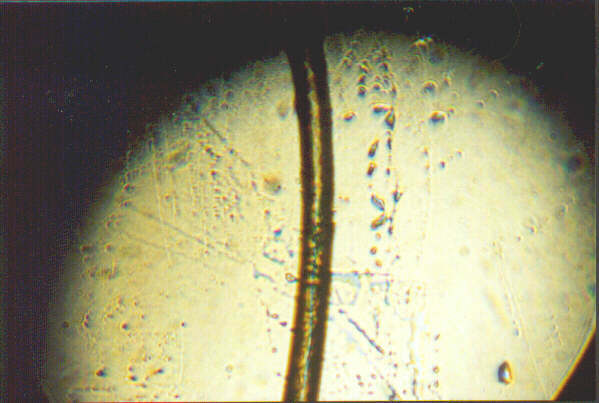 This relationship was then applied at a higher magnification level to the measurement of the fibers mentioned. 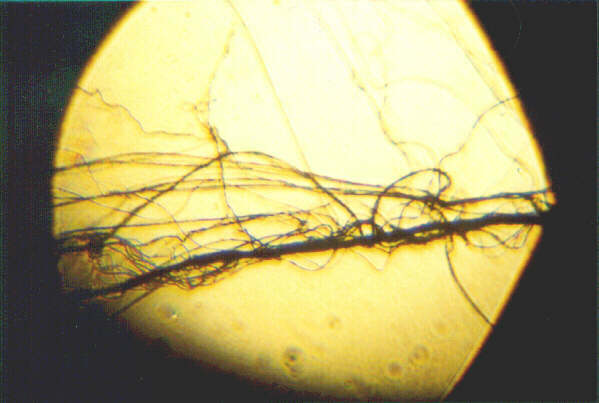 Candidate comparison fibers range from 7 microns (spider web) to 65 microns(human hair) as shown in the table above. A micron is 1/1000 of a centimeter, or 1 / 25,400 inch. 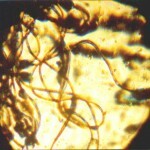 At this point, closer examination of the ground sample fibers revealed the extremely unusual and small size of these fibers. An initial calculation of approximately 1 micron was arrived at for the ground sample. 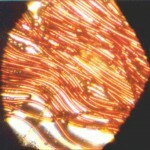 This measurement exceeded the limits of accuracy of the method of measurement being used, and consequently a lab grade microscope was sought for the final measurement. 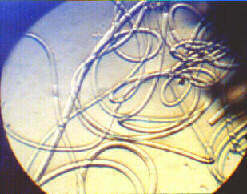 Under a lab grade microscope, the fibers in question from the ground sample were measured as being LESS than one micron. No measured natural or synthetic fibers suggested as possible explanations for the ground sample are even remotely close to this size. 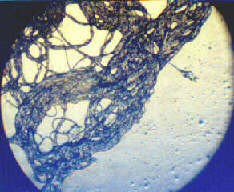 The nearest candidate for a known fiber of this size is asbestos. For a variety of reasons, it is known that the material under evaluation is not asbestos, which will also be explained in more detail later. Asbestos is a material that is under comprehensive management by the United States Environmental Protection Agency. 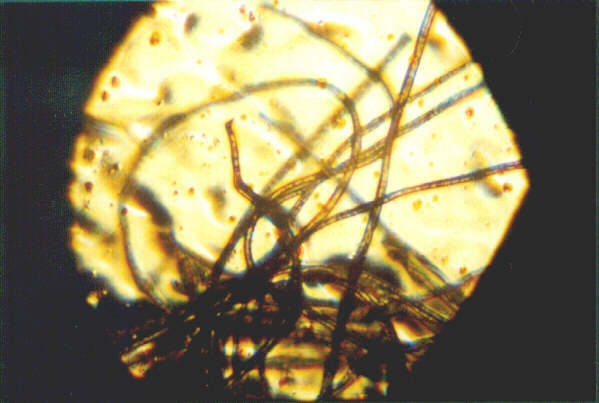 It is managed as such because of the health risks and hazards associated with microscopic fibers of this size range. A wide variety of information on the hazards and illnesses associated with asbestos is easily accessible on the internet, and readers are encouraged to become familiar with it. The analysis above demonstrates that the material in question should likely be subject to the same level of scrutiny and investigation on behalf of the welfare of the general public. 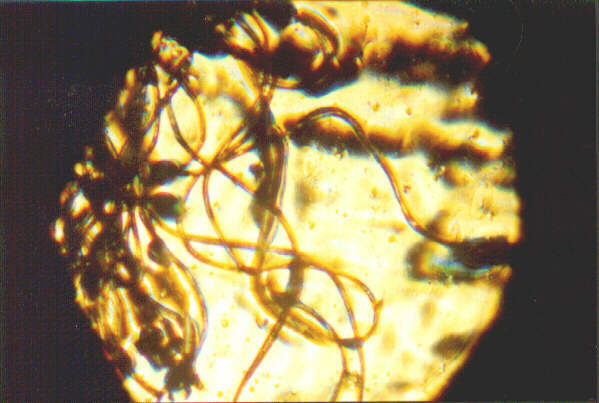 This is especially the case if it is later demonstrated that these fibers are a direct result of aircraft activity in the open environment, which is now commonly reported and documented with reports and photography. 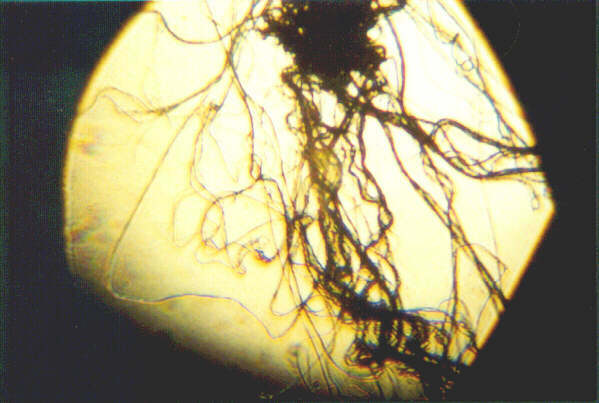 There are obvious health risks associated with the ingestion of microscopic fibers of unknown origin and composition. 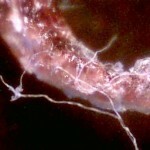 It is also important to note that a individual fiber of this size would not normally be visible to the human eye. 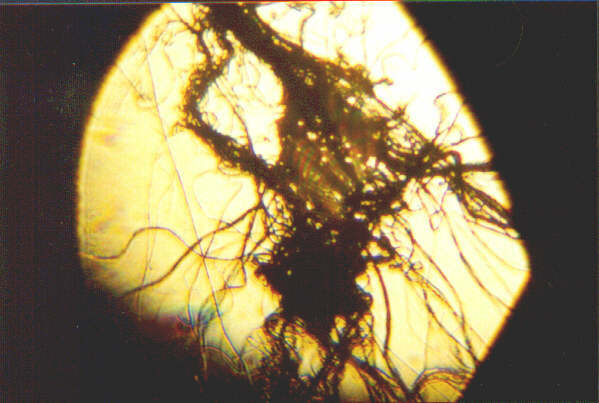 It is not known at this time whether the fibers under examination will dissolve or remain in the human body over time. It is also reasonable to expect that the United States Environmental Protection Agency, administered by Carol M. Browner, is dutifully obligated to accurately and completely identify the material in question, and to disclose those results to the American public. Consequently, a small portion of one of the ground samples has been delivered by certified mail to Carol M. Browner of the EPA, and the citizens of this country are encouraged to inquire as to the results. The collecting of additional samples by observers will be of benefit in providing further material for examination and analysis. 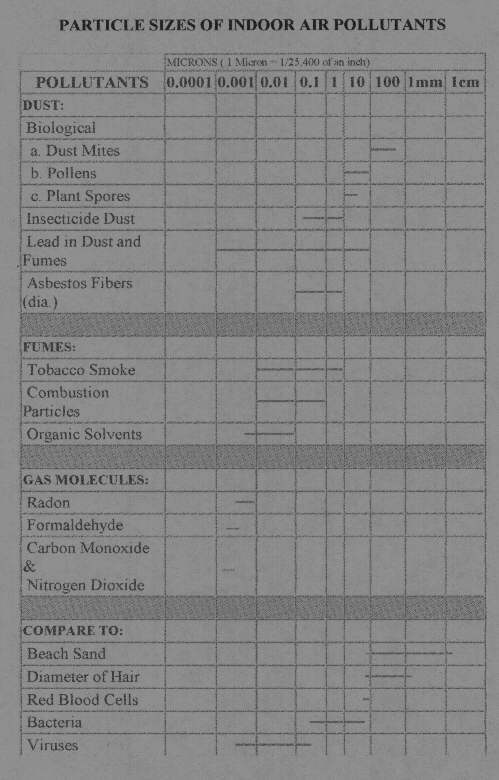 Below follows a chart (a direct link to the reference source is provided) of particles of various sizes, including the microscopic levels now associated with the ground samples that have been received. It will be observed that particles on the order of a single micron include some bacteria, asbestos fibers, tobacco smoke, combustion particles and insecticide dust. The chemical solution for the first test consists of the following: Water, Ammonium Thyoglycolate, Butylene Glycol, Sodium Hydroxide, Ammonium Hydroxide, PPG-12-PEG-50 Lanolin, Sodium Lauroamphoacetate, Diammonium Dithiodiglycolate, Laureth-23, Pentasodium Pentetate, Choline Bicarbonate, Teacocoyl, Hydrolyzed Collagen, Styrene/PVP Colpolymer, Fragrance, Annato. 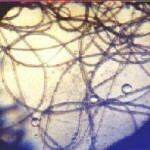 This chemical solution has little to no effect upon the spider web fibers, as can be seen in the photographs. 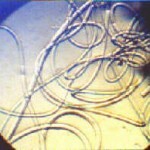 In contrast, the solution applied to the ground sample causes a marked congealing reaction to the fibers. 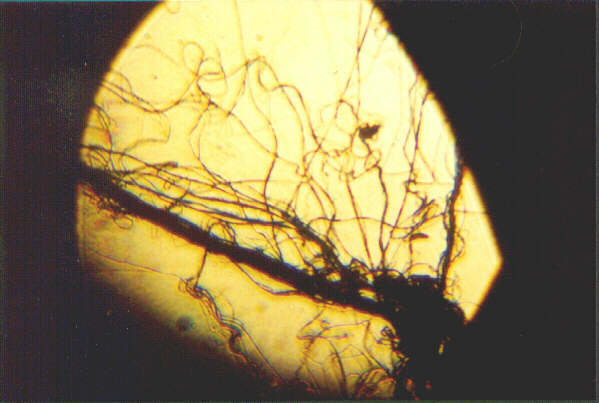 Since the same chemical test was applied to both fibers in an equal manner, this demonstrates that the two fibers types are unique from one another in addition to the visual criteria defined earlier, and that therefore the ground sample is not composed of spider web fibers. 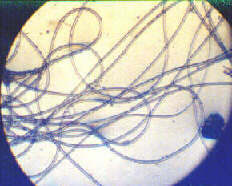 Sulphuric acid causes an immediate contraction of the ground sample fibers. 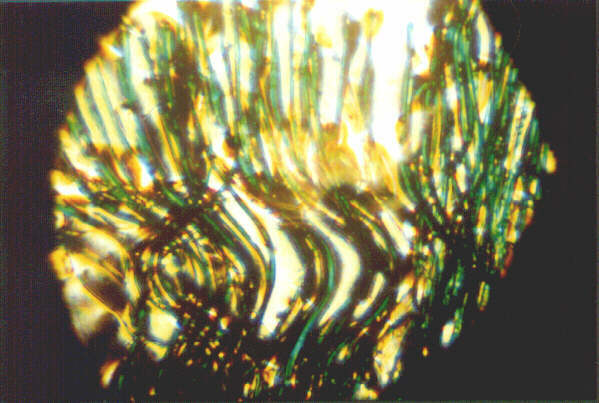 The microscopic wave forms within the ground sample fibers become smaller and even more pronounced than in the original fibers. The ground sample fibers will eventually dissolve in the sulphuric acid solution, after approximately 15-20 minutes. 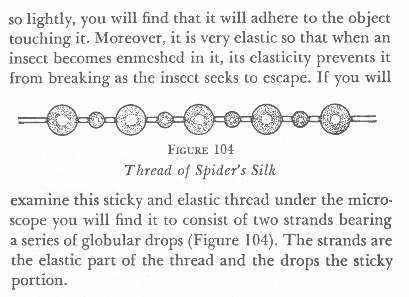 In contrast, sulphuric acid causes no change in the smooth form of the spider web fibers, and actually results initially in an enlargement of the fiber size. Spider webs will also eventually dissolve in the solution of sulphuric acid, although the process takes longer than with the ground sample, i.e., approximately 35-45 minutes. Equal amounts (1 drop) of both methyl ethyl ketone and acetone were added to each fiber type. There is a reaction of effervescence in both cases. 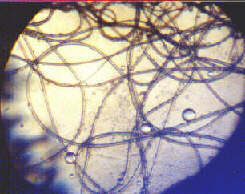 In the case of the spider web fibers, effervescence is mild in nature, with fewer and larger gas bubbles produced, as can be seen in the photographs shown. 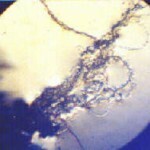 In the case of the ground sample, effervescence is extremely active, with generally smaller and many more gaseous pockets produced. In addition to the six defining physical and visual criteria of distinction between spider webs and the ground sample which have been presented earlier, these three chemical tests further distinguish the fiber types from one another. 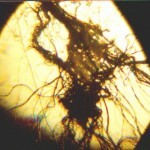 At this point it has been demonstrated that the ground sample fibers cannot currently be identified as any known or common natural or synthetic fiber. A minimum of nine different criteria also clearly demonstrate that they are not of spider origin. 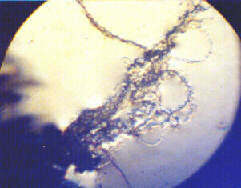 They are sub-micron in size, and they can be considered a potential health risk until they are positively identified. Further analysis and interpretation by those within the chemistry profession of the results which have been presented is both welcome and desirable. It is also significant that unusual aircraft activity was observed in conjunction with the presence of the ground samples currently being analyzed. It is appropriate that the Environmental Protection Agency, administered by Carol M. Browner, positively and completely identify the ground sample that is being provided to her, and that this agency promptly release the results of those tests to the public. The primary behavioral characteristics of this material have been previously described. These include high adhesiveness and elasticity. 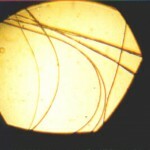 The sub-micron width and the microscopic wave forms within the fibers has also been discussed in detail. It may be of value to surmise the expected behavior of such filaments if they are determined to originate from flight altitudes.